German truck maker MAN Group said on Friday that two subsidiaries will pay fines of €75.3 million each to German authorities to resolve corruption charges first disclosed in May this year (here). The fines were imposed against MAN Nutzfahrzeuge AG (the commercial vehicles division) and MAN Turbo AG (the compressors / turbines division) by the public prosecutors' office in the Munich District Court. The company announced at the same time a €20 million settlement with German authorities for unpaid taxes. MAN's releases about the settlements are here and here. The company separately disclosed (here) that two executive board members of MAN Turbo had resigned "to clear the way for new management." Dr. Gerhard Reiff had been on the board since 2005 and Dr. Stephan Funke since 2007. MAN's internal investigation uncovered suspicious payments of €51.6 million relating to around 80 transactions. The payments were found in a number of countries and most were through agents and other intermediaries. The company said it has fired 20 employees and is considering suing them for damages. It didn't disclose the countries involved or who may have received illegal payments in the form of "so-called referral commissions." The internal investigation involved "around 70 lawyers, auditors and tax experts . . . working since mid-May to analyze the suspicious payments made in the last ten years at all of MAN’s subgroups." MAN is Germany's second largest truck, bus and diesel-engine manufacturer behind Daimler AG. It reported revenue in 2008 of €14.9 billion and has 51,000 employees worldwide. The company said it launched a compliance initiative in July. It said it will disclose to prosecutors any future suspected bribery cases and cooperate with them, establish a revamped compliance office on January 1, 2010 reporting directly to the executive board, provide hands-on compliance training to all employees in sales, purchasing, and marketing jobs, use an IT system designed to reveal any suspicious payments, abolish "referral commissions," and impose due diligence requirements on all agents. MAN said it will also continue talks with various anti-corruption NGOs about joint projects. The company is listed on the German DAX and its largest shareholder is Volkswagen. MAN AG's ADRs trade on the over-the-counter pink sheets under the symbol MAGOY.PK. It hasn't disclosed any investigations by the U.S. Justice Department or SEC. Prosecutors in Munich think German truck-maker MAN AG paid bribes to customers between 2002 and 2005 of around €14 million to boost sales. According to recent reports (here), some of the alleged payments inside and outside Germany were concealed by being routed through bank accounts of relatives and friends of MAN employees. 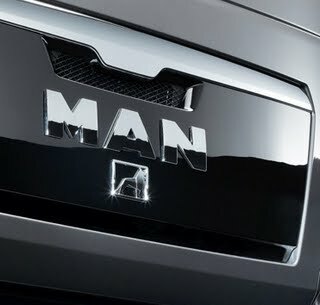 MAN is Germany's second largest truck, bus and diesel-engine manufacturer behind Daimler AG. It reported sales in 2008 of €14.9 billion and has 51,000 employees worldwide. MAN is listed on the German DAX and its largest shareholder is Volkswagen. Prosecutors said they're investigating "well over 100" people alleged to be involved -- including both marketing staff at MAN and customers suspected of having taken bribes. Reports said about 300 police personnel across Germany are now involved in the investigation. So far, two people have been arrested but one was released. MAN itself has reacted to the allegations -- which are sensitive in Germany following resolution late last year of Siemens' global corruption scandal -- by announcing its own internal investigation. It said in press releases last week (here and here) that it has hired "an external auditing firm to fully clear up suspicion of improper commission payments alongside its own auditing department." MAN said it has already fired some employees found to be involved in the graft and will share all of its findings with prosecutors. It said it may also sue ex-employees found to have violated the law. Prosecutors apparently started their investigation after a tip from tax authorities. Reports said MAN's top management hasn't yet been implicated. In a public statement, MAN said: Compulsory conduct guidelines and clear rules that have been further developed in recent years apply to all employees at MAN. They forbid MAN Group employees from conferring benefits of any kind with the aim of obtaining orders or unfair advantages for MAN or other persons. In addition, MAN’s compliance system includes a compliance officer and a steering committee tasked with enforcing the rules, a compliance hotline and two external ombudspersons who employees can also contact anonymously. U.S. authorities may not have jurisdiction over MAN under the Foreign Corrupt Practices Act. Unlike Siemens, the company has no securities traded on a U.S. exchange and doesn't have any large U.S. operations. Our thanks to the readers who sent us links to the stories about MAN. Such hearts—ah me, how many!—were stilled twenty years ago; and to us who remain behind is left this day of memories. Every year—in the full tide of spring, at the height of the symphony of flowers and love and life—there comes a pause, and through the silence we hear the lonely pipe of death. Year after year lovers wandering under the apple boughs and through the clover and deep grass are surprised with sudden tears as they see black veiled figures stealing through the morning to a soldier's grave. Year after year the comrades of the dead follow, with public honor, procession and commemorative flags and funeral march—honor and grief from us who stand almost alone, and have seen the best and noblest of our generation pass away. But grief is not the end of all. I seem to hear the funeral march become a pæan. I see beyond the forest the moving barriers of a hidden column. Our dead brothers still live for us, and bid us think of life, not death—of life to which in their youth they lent the passion and glory of the spring. As I listen, the great chorus of life and joy begins again, and amid the awful orchestra of seen and unseen powers and destinies of good and evil our trumpets sound once more a note of daring, hope, and will.